Play the 141st British Open Championship at Fylde Links this week with the OptiShot Simulator swing analysis. 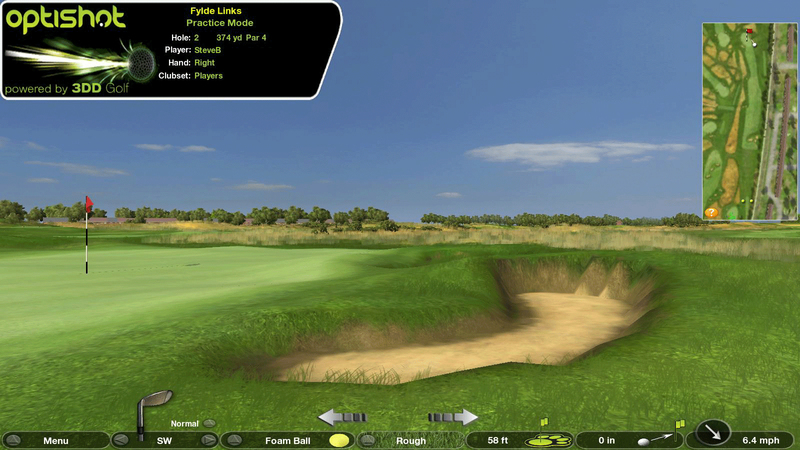 The authentic classic links golf course replica includes 200 Bunkers and Wind variables but not the cold, just like the Pro’s such as Tiger Woods face playing at Lytham & St. Annes, Lancashire, England. This will be the 11th time the Open Championship has been played at Lytham. Imagine being able to play 18 holes of the 2012 Open Championship or any of the World’s best courses with your own clubs, anywhere you want, in about 2 hours or less. See Fylde Links Youtube video: http://youtu.be/q6BrfDjHu9Qv. The sports tech company who invented the OptiShot in 2005 is Dancin’ Dogg Golf (3DD) http://www.dancindogg.com/. 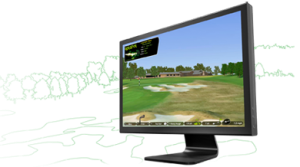 3DD has 20 golf course replications in their Library of Courses. A new Sim is created for each upcoming Major venue. The last Major OptiShot Sim created was the U.S. Open, hosted by the Olympic Club at the Golden Gate Club course in San Francisco. Next up will be the PGA Championship at Oak Hill, followed by the Ryder Cup being played at Medinah, Chicago. Updates are free for current users. OptiShot has developed proprietary technology that is at the core of their golf Sim accuracy. The ‘Shot Tracer’ is patent pending and uses 16 infrared sensors built into an artificial turf Infrared Optical Swing Pad that shoots 10,000 lights pulses per second which enables it to reconfigure your swing and path. Crystal clear graphics help give you the ability to see exactly what your swing entails. You will be able to visually track the ball flight off a swing, or use the putt grid, to help improve your game. Hit balls into a sheet, impact screen or net that you set up indoors. Use your living room, garage, office or a dedicated Simulation room. Try playing or practicing after work, late night or on the weekends, whatever time works with your schedule. Simply connect OptiShot to a computer, HD TV or projection screen, and you are ready to begin helping to improve your swing mechanics with the Live Feedback. Use the overhead look or course fly over to help visualize your next shots. FAQ: What statistics does OptiShot provide? The data and feedback this 3DD product produces is expertly tested under proper operating conditions to have club head speed accuracy of +/- 2.0 miles per hour. Face angle accuracy is within +/- 1.5 degrees and swing path within +/- 2.0 degrees. 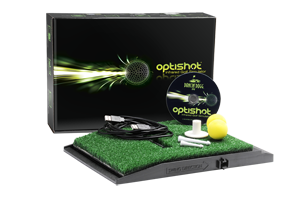 You can use the portable OptiShot as a practice or instructional tool. Professional instructor and the 2011 PGA Teacher of the year, Mike Maleska, is using the OptiShot to provide lessons. A series of 3DD lesson videos and tips are posted on Youtube. The System has Practice and Play Modes, plus a Driving Range, to help focus your training. The techie software developers hail from here in Seattle. Like many other golfers, they too had the grind of work and family combined with elements like rain which prevented them from playing golf as much as they wanted to. 3DD is a SMB sportsbiz with 13 employees. 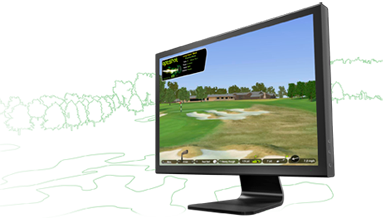 Other golf simulators are price pointed in the thousands of dollars. The OptiShot is priced at a reasonable $399.95. The OptiShot is currently available in North American and will soon launch into Europe and Asia. This is a PC product only. An area 10′ x 10′ with 8.5′ ceilings is recommended. Up to 4 players can join in the fun. Sports Techie, the OptiShot is an innovative, proven and cost effective sports technology option for use by the Recreational and Beginner golfer as well as for Pro’s. Use it to try mastering all your swings, using all your clubs, from anywhere on the course. You can also learn better course management skills. 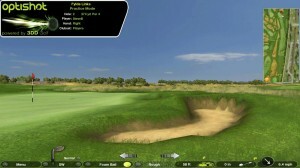 Play the opening par 3 hole at the 2012 Open Championship at Fylde Links today with the OptiShot Sim.